The Clintons’ official statement on the passing of Congressman Tom Lantos (D-CA) A great American leader and champion for human rights and Humanitarian causes who was the only survivor of the Holocaust ever to be elected to serve in congress. Clinton: President’s Cuts Would Have Drastic Impact on New York’s Homeland Security Efforts Washington, DC – Senator Hillary Rodham Clinton today, amid recent reports the Administration plans to drastically slash homeland security funds for first responders, called on the President to reconsider these cuts, and to provide information regarding how any reduction to homeland security funding would make our nation safer. In a letter today to President Bush, Senator Clinton cited the importance of federal homeland security dollars for our nation’s police, firefighters, and other first responders, and the effect such drastic budget cuts would have on port and transit security and local emergency management operations in New York and through the country. Recent reports indicate that in your Fiscal Year 2009 budget, you intend to drastically slash homeland security funds for our first responders. A recent National Intelligence Estimate could not have been clearer when it said that our homeland is under a “heightened threat environment” and that Al Qaeda is undeterred and determined to attack us here at home. In October of this year, you issued the National Strategy for Homeland Security, which detailed many of the threats against our nation. In light of these facts, it is unimaginable to hear that you would cut funding for our nation’s law enforcement, firefighters, and other first responders by more than half. According to news accounts, your plan for the coming year includes the elimination of programs for port security, transit security and local emergency management operations. Reductions like this to some of the core functions of our homeland security would be extremely irresponsible. Your budget outlines the fiscal priorities for the coming year. If these news reports are correct, then I believe you have greatly underestimated the threats we face. Securing our homeland requires constant vigilance and we must do everything within our power to improve our level of preparedness. These reported cuts undermine those efforts. As a Senator from New York, I know first hand the importance of these critical programs and the drastic impact any funding reductions would have to New York’s, as well as to our nation’s homeland security efforts. For the sake of our nation’s homeland defense I implore you to reconsider any proposed cuts to our critical homeland security programs. Before any proposed reductions in funding for our homeland security, I respectfully request that you provide a detailed plan on how any reduction in critical homeland security funds would make our country safer. Homeland security funding decisions should be completely based on the threats facing our homeland, not any political considerations. New York — Senator Hillary Clinton (D-NY) has recently reiterated a position she originally enunciated in 1999 when she stated that, “I personally consider Jerusalem the eternal and indivisible capital of Israel” and also called for secure, defensible borders for Israel. Senator Clinton’s office has issued a paper, ‘Hillary Clinton: A Long History of Strong and Steadfast Leadership for the U.S.-Israel Relationship,’ which states that “Hillary Clinton believes that Israel’s right to exist in safety as a Jewish state, with defensible borders and an undivided Jerusalem as its capital, secure from violence and terrorism, must never be questioned” ( New York Sun, September 17). 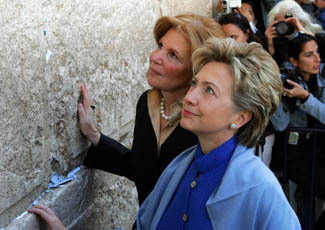 Senator Clinton’s stance is in line with Congressional support for the indivisibility of Jerusalem. In 1995, the U.S. Congress passed the Jerusalem Embassy Act, which calls for the U.S. Embassy to Israel to be moved from Tel Aviv to Jerusalem, and recognize Jerusalem as Israel’s capital. Regrettably since that time, both Presidents Clinton and Bush have exercised waivers to defer implementing this law, passed by overwhelming 90% plus majorities in both Houses of Congress. State of Israel … will include most of the area of the Land of Israel as it was under the rule of the British Mandate, and alongside it a Palestinian entity which will be a home to most of the Palestinian residents living in the Gaza Strip and the West Bank. We would like this to be an entity which is less than a state … “The borders of the State of Israel, during the permanent solution, will be beyond the lines which existed before the Six Day War. We will not return to the 4 June 1967 lines … The security border of the State of Israel will be located in the Jordan Valley, in the broadest meaning of that term … [Israel will undertake] the establishment of blocs of settlements in Judea and Samaria … The responsibility for external security along the borders with Egypt and Jordan, as well as control over the airspace above all of the territories and Gaza Strip maritime zone, remains in our hands. June 03, 2004 FOR IMMEDIATE RELEASE Contact: Morton A. Klein, 212-481-1500 http://www.zoa.org/2004/06/zoa_bushs_call.htm NEW YORK- The Zionist Organization of America (ZOA) is requesting clarification of the apparent contradiction between President Bush’s latest call for Israel to return to the indefensible 1967 borders, and the promise he made to Israeli Prime Minister Ariel Sharon less than two months ago that Israel would not be expected to return to those borders. But in his April 16 meeting with Prime Minister Sharon, at the White House, President Bush said that “it is unrealistic to expect … a full and complete return” by Israel to the pre-1967 borders. The ZOA notes that there have been additional indications that the Bush administration has backtracked on the promises to Sharon, including the May 3 Quartet statement that Israel “must end the Israeli occupation that began in 1967”; the May 6 statement by President Bush, after meeting with Jordanian King Abdullah II, that the U.S. would not take any positions that would “prejudice” negotiations over the borders; and President Bush’s May 17 speech to AIPAC, in which he conspicuously failed to reiterate the promises he made to Prime Minister Sharon even though he was speaking to a pro-Israel audience that would have appreciated such a statement. The ZOA points out that the claim that there is still an Israeli ‘occupation’ of the Palestinian Arabs is a myth. Those parts of Judea-Samaria-Gaza where 98.5% of the Palestinian Arabs reside are under the rule of the Palestinian Authority, not Israel. The Israelis withdrew from those areas during 1994-1997. The PA currently rules more than 80% of the Gaza Strip and more than 40% of the Judea-Samaria territories. Those parts of Judea-Samaria that Israel still controls should be characterized as disputed, not occupied. No other country has a valid legal claim to the area, and even Jordan, which illegally occupied it from 1949-1967, publicly relinquished its claim in a speech by King Hussein back in 1988. Moreover, Israel’s legal, historical, and religious claim to those areas is far stronger than the claims of the Palestinian Arabs or any other party. Washington, DC – Senator Hillary Rodham Clinton joined her Senate colleagues, led by Senators Schumer and Graham, in urging the Bush Administration to seek the support of America’s allies in the Middle East as they move forward with plans for a future international meeting on the Arab-Israeli conflict. In a letter to Secretary of State Condoleeza Rice, the Senators stressed that the inclusion and cooperation of Arab countries with close relations to the United States would be a critical factor in the success of such a meeting. As you step up American diplomatic actions and prepare for a future international meeting on the Arab-Israeli conflict, we believe it is essential that other key players in the Middle East also step up and meet their responsibilities. The success of such a meeting, and ultimately the peace process itself, will depend on the cooperation we receive from the larger Arab world, particularly from those Arab states with close relations with the United States who have not yet signed agreements with Israel. Your ongoing efforts to work with Israeli Prime Minister Ehud Olmert and Palestinian Authority President Mahmoud Abbas are critical, but so is the support these efforts receive from those Arab countries. We know that in the past, the lack of sufficient support from some of the Arab states have made it difficult to reach earlier agreements. We also know that, for many years, many of these countries have been insisting on greater involvement by the Administration in the Arab-Israeli conflict. Now that you and the Administration are indeed more actively engaged in Middle East diplomacy on an ongoing basis, we also believe that these Arab states should step forward with concrete, positive actions to promote peace and stability in the region. 6) Pressure Hamas to recognize Israel, reject terror and accept prior agreements, and isolate Hamas until it takes such steps. We are encouraged that you are working hard to advance the cause of peace in the Middle East. The governments of Israel and the Palestinians are also working as best they can towards that goal. However without a sincere commitment from our allies in the Middle East to be partners in this effort, peace in the region will remain elusive. “I am saddened and outraged by the repeated rocket attacks against the Israeli cities of Sderot and Ashkelon, attacks that were perpetrated even as the Shavuot holiday came to a close. Yet another round of attacks by Hamas and other Palestinian terrorist groups against civilians demonstrates an escalation of violence against Israel. 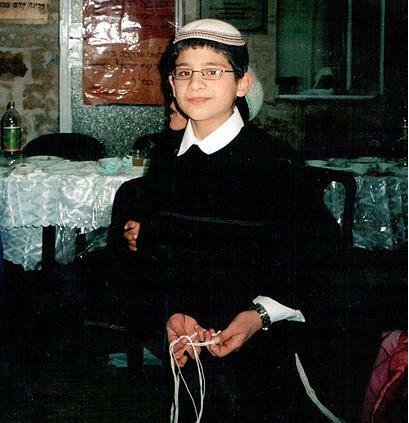 The rockets have hit homes, synagogues, and schools, injured many and killed nine innocents. Israel’s right to exist, and to defend its people against imminent threat, must never be put in question. Israel has demonstrated restraint in the face of ongoing of attacks on southern Israel orchestrated from Gaza. The United States and the international community must stand in support of Israel and send the message to Hamas and to any terrorists who threaten innocent lives on sovereign soil and operate in violation of international law that this behavior will not be countenanced. On Sunday, Rabbi Kenneth Hain, spiritual leader of Congregation Beth Sholom in Lawrence, invited U.S. Sen. Hillary Clinton (D-New York) to the shul’s library in a gathering of about 30 local religious and political leaders to discuss ways they could revive the case. Other topics were also discussed in the meeting, to which the press was not invited. As a powerful Democrat, he said, Clinton will be able to pressure the White House and the State Department to force the Syrians to move on this issue. He said dealing with the Syrians is very difficult because they are known to change their minds, but he feels the Syrians are ready to negotiate for his release, providing Baumel is indeed alive, since they clamor for U.S. support now. The meeting was a successful one, according to Mansdorf, who was among those who attended. “There’s always hope,” he said. Mansdorf also praised Rep. Carolyn McCarthy (D-Mineola) for her part in trying to uncover more about the case. “She’s been very supportive as well. These two women, perhaps because they are mothers, have been extraordinarily supportive,” Mansdorf said of Clinton and McCarthy. Baumel, who would now be in his 40s, moved from the U.S. to Israel in 1970 and joined the Israeli army in 1979. He has been missing since June 1982 when he was engaged in a tank battle with Syrian forces on the Lebanon-Syria border. He was serving his last 10 days of army duty when he was captured. Since then, Baumel’s father, Yona, and his mother, Miriam, have not rested, with the search for their son consuming their lives. Although many have given up hope that he is alive, his parents have not. They have met with leaders throughout the world in their quest to find out more about their son’s disappearance. The missing soldier’s family is now urging people to write letters and send e-mails to government officials, urging them to seek information on the case. Baumel’s father also recently addressed the congregation at Young Israel of Woodmere on Peninsula Boulevard, spelling out his anguish of not being able to see his son for nearly a quarter-century. All friends of America, Israel and Democracy are urged to attend – this is not a political issue. This is about standing up to the threat of evil against the freedom and values we all share.